Enjoy a view that rivals the "Oasis". The views from this street are quite possibly the best on all of the North Shore & this lot may have the best view on the street. Building site located above the 722 flood plain. 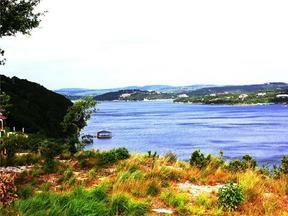 Place a private dock over the incredibly deep waters of the main body of Lake Travis or enjoy the Waterford marina. Property lends itself nicely for a personal tram to drop you off at the foot of your dock regardless of how the lake level fluctuates. Disclaimer: All information deemed reliable but not guaranteed and should be independently verified. All properties are subject to prior sale, change or withdrawal. Neither listing broker(s) nor Keller Williams Realty shall be responsible for any typographical errors, misinformation, misprints and shall be held totally harmless. Database last updated 04/19/20195:13:07 AM.